We said goodbye to longtime friends Cory and Elaine. We've known them 11 years and yet we've only spent time together twice! But getting together is almost like we do so on a much more regular basis. Lots of laughs, and I'm sure we'll be seeing them again sooner than 11 years from now! We hit the road, heading towards Vancouver, and the big Abbotsford RV show. Thanks for the hospitality guys... looking forward to next time...! Yesterday's drive, 132 kms (82 miles). We got to the RV show at about 11:30am. We're walking from the parking area up to the entrance, and who do we see? Friends Doug and Nancy who live in nearby White Rock! We had actually been in contact with them,but didn't think we would have time to get together until we get back here in mid October. Elaine had set me up with $1 off coupons for the admission. It was supposed to be $8 for adults, and $6 for seniors. But there was nothing saying at what age a senior is, so when we got up to the entrance, we simply said "Two seniors please", and with our $1 off coupons we got in for $5 each! 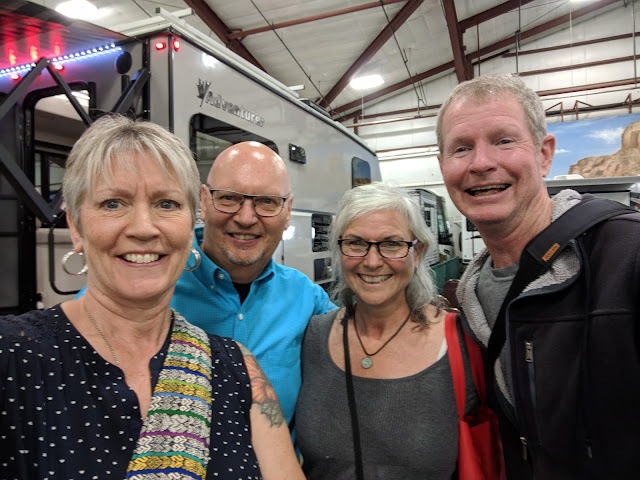 We sat and chatted with Doug and Nancy for a while, and then set off on our own to check out the RVs. We have no interest in buying a different RV... at least not here in North America. But it's fun to have a look at what the new ones are like, and to see if there was anything that we liked. And there was not much that we liked! We have no interest in either 5th wheel trailers, or travel trailers. But we looked at quite a few motorhomes, camper vans, and pickup truck campers. The big expensive (>$250k) motorhomes were fun to look at, but even if we could afford one, we have zero interest in owning something that big. We liked the layout of this van, but at $94,000 CAD ($73,000 USD) it's really hard to justify. Fun, but not for us. This 20 ft Class C piqued our interest. And at $58,000 CAD ($45,000 USD the price was reasonable. This is the interior of a pickup truck camper! Huge pickup truck camper at $68,000 CAD ($53,000 USD). Lots of RVs and lots of people! This was probably our favorite floorplan, but the paint job was a little loud for our liking. And the $135,000 CAD ($105,000 USD) price tag was a little ridiculous. Nancy, Doug, Ruth, Kevin selfie! We said goodbye to Doug and Nancy and headed to the community of Crescent Beach. We stopped at a highway rest area first to use the free dump station. Traffic was bad, as apparently it always is heading into Vancouver. Between that and the ridiculously high real estate prices, we sure wouldn't want to live in this area. Like Toronto, it's nice to visit, but I wouldn't want to live there! We found Bernd and Angi's house and got ourselves backed into Sherman's parking spot for the next three weeks. This is one of the couples who were with us on the last Mexico RV Caravan. Really nice to see them again! Breakfast is ready... gotta go! For the dog owners... Wellness Core Dog Food is on deal of the day today! Welcome to the lower mainland, for us now a nice place to be from... Some of those RVs are crazy expensive. Yep, I bet you are much happier on the island! Most of those RV's are expensive, not just some of them. We would never buy new, that is for sure but it was fun looking at them. It is nice to look at RV's but we have no desire to replace this one. We had a 24 foot class C and a van conversion and they both worked well. But for our full-time lifestyle this one does the job, perfect layout, Though a few feet longer at 36 ft than we had planned. Nice to visit with friends again as well. We too have no desire to live in or even visit a large city, country living and small towns are more our style. If we are lucky / or unlucky this will be our last Rv. Ours isn were than yours and some newer technology. We do spend a bit on repairs and maintenance , but it does have 145 K miles on it. Averaging 8K miles a year. I don't think we'll ever get to meet up with Doug and Nancy. We're friends on FB. We like the class B but like you said, way too expensive to justify. Almost better to make your own and I have been watching many home conversion. It is best to look for a good used Class B, which is what we will eventually do if we plan to drive down to South America. New is nice, but the depreciation is hard to swallow. You could drive many miles on what you'd save buying used. Yes, it is, see you. Todays RV prices are so ridiculous. Glad you had a good day. Enjoy your stay in White Rock. Yes, we think they are really high as well, one of the many reasons that we would never by new. We like doing the looky-loo scenario at RV shows (tho not in hot sunshine), as long as they're not crowded. Like you, we're not interested in buying something new, but it's fun to look. Yep, it wasn't too bad busy-wise and we had a fun time but definitely not looking to buy anything. Wow, that truck camper has a much nicer and larger kitchen than our 32'9" motorhome! But ours is a 2007 model, and kitchens have become more important to a lot of folks. We rarely eat out while RVing, so we would have loved a kitchen like the one in that truck camper. Interesting indeed! Yep, I think kitchens are important to some people. Like you we rarely eat out and when we were looking at the different units, one of the first things I would look at is if it had an oven. Whenever we end up getting a new to us unit, it will have to have an oven!